With this presentation of Ohio Wesleyan University’s Alumni Award, the Ohio Wesleyan Alumni Association Board of Directors is proud to recognize Evan R. Corns for serving as a constant champion and strong supporter of his alma mater. As an Ohio Wesleyan student, Evan majored in history and was a leader in the Sigma Alpha Epsilon (SAE) fraternity. As an OWU alumnus, Evan has remained actively engaged with the University. He joined the Board of Trustees in 1992, serving first as a Trustee-at-Large, then an Alumni Trustee, and now a Life Trustee. He also is a member of the Alumni Advisory Board for The Woltemade Center for Economics, Business and Entrepreneurship. In support of Ohio Wesleyan’s students and faculty, Evan has created multiple endowments over the years, and others have created endowments to honor him. He donated funds to name the R.W. Corns Building in memory of his father and has been a strong supporter of Battling Bishop athletics and Team OWU. He and his wife, Barbara P. Corns, are members of the Founders’ Circle, Tower Society, and President’s Circle. Evan also has been a longtime OWU volunteer, serving as an Annual Fund Class Chair, Annual Fund Fraternity Volunteer, and Annual Fund Decade Chair. He served as Co-Chair of Ohio Wesleyan’s previous capital campaign and in numerous leadership positions in other campaigns. A savvy businessman, Evan co-founded America’s Body Company in 1976. Under his leadership, it became the largest business of its kind in the United States, with seven facilities nationwide and sales of more than $120 million annually. Evan, who holds an M.A. from the University of North Carolina, also served his county in the U.S. Army. In recognition of his personal and professional success, Evan was inducted into the Ohio Foundation of Independent Colleges (OFIC) Hall of Excellence in 2010. 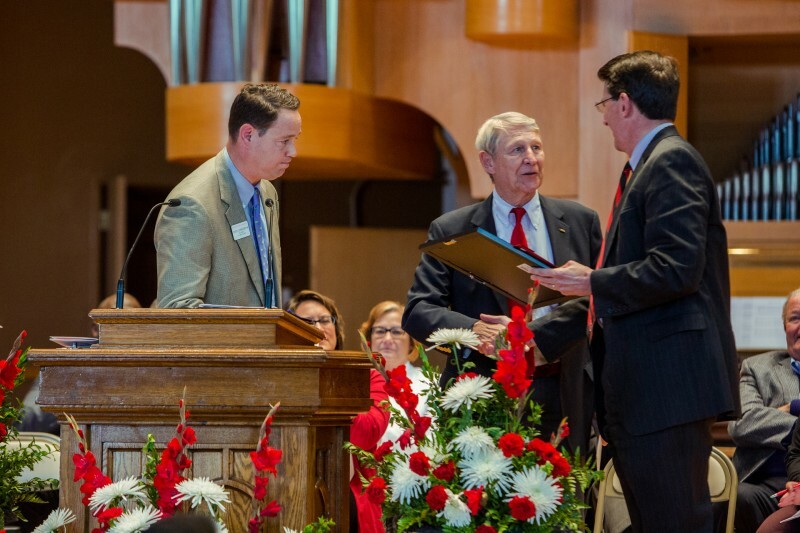 Although it’s always a great day to be a Bishop, today is especially meaningful as we recognize Evan R. Corns with the Alumni Award for his lifetime of dedicated service to Ohio Wesleyan and the campus community.